Five and a half years ago I already have written about the shift towards mobile use of the Internet and growth of social media. Now, “mobile” is bigger than ever and the trend does not stop as more and more services come online which focus on a great mobile user experience. So it is not really a surprise that Google expresses a clear focus on web optimization for mobile access and mobile devices. 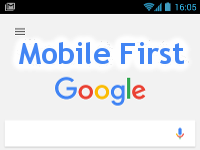 Gary Illyes announced at the Pubcon  conference in Las Vegas on Oct. 13, 2016 that Google is switching to mobile-first indexing. This means websites which are not mobile friendly in Google's eyes will be kicked out and moved to the secondary index. Furthermore the secondary index is not updated as frequently as the primary index is. This will be a huge disadvantage for those sites if they rely on search engine traffic from Google. Responsive design or serving an optimized “mobile version” of a site to users on mobile devices has become the industry standard for “mobile friendliness.” However, that's not where Google wants the improvements to stop. Coping with small screens limited input capabilities is not nearly enough. Users want that sites load very quickly in under 2 seconds. Therefore, Google has launched its Accelerated Mobile Pages (AMP) (↑) open source project in February 2016. This project tackles low Internet connections speeds as well. At first, this seems counter-intuitive since mobile high speed LTE Internet connections with speeds of up to 150 Mbit/s become more widely available at affordable rates. In fact in many rural areas mobile connectivity is the only and in many cases best choice you can get. LTE/4G Internet access is nowadays available in 102 countries, … but with limited coverage. On a worldwide scale only 50% of mobile users are covered with at least 3G. The remaining 50% of mobile users are stuck with low speeds: 56 kbit/s for 2G and 220 kbit/s for 2.5G like EDGE. Now the AMP project makes more sense. It has never been more important to provide users with mobile devices the best user experience possible. Google will hold you accountable. Adopting AMP does not need to create you a headache, at least, if your website is powered by popular software like WordPress which has 70% market share among content management systems (CMS) and powers more than 20% of all websites on the Internet. Just search for the appropriate plugin. Joast-de-Valk shares some detailed recommendations on AMP for WordPress (↑). But AMP is already available for other popular CMS platforms like Joomla and Drupal. Thanks to the open source nature of the project AMP is already supported by many platforms (↑). protocol for all websites could be something Google has on its wishlist for the future. We will see. Now you will ask what this is about. Just my little tribute to fellow Internet marketer Case Stevens who had disappeared from the scene for a couple of month due to serious health issues. I am very glad to hear that he is up and running again … back on his blog, too. And there is even one more reason to write this post. Case addresses an important issue in his first post after his disappearance. Should be a no brainer. Posted by John W. Furst in Miscellaneous, Social Media on Sunday, October 11, 2009 has got 1 Comments.